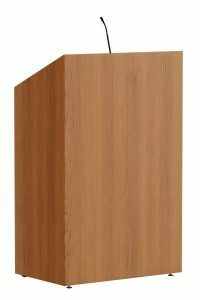 Classic lectern in wood. The lines in the solid wood on the corners give the lectern character. 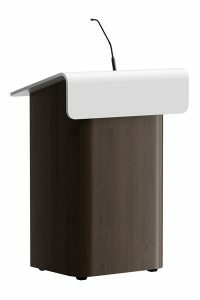 This classic lectern fits perfectly in beautiful old restored buildings. 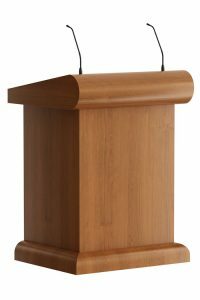 Despite the classic look the lectern is equipped with all modern techniques. On top of the desk options are available for wall outlets, cable manager with HDM, VGA, DVI, ethernet and audio connections. With doors and drawer it is also a high value piece of furniture as maitre d station in hospitality industry. 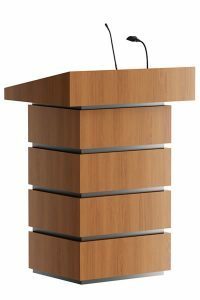 See also our lecterns Claxik, Grand, Amynent.